The Speedlock 3000 Boker automatic knife provides push-button convenience. 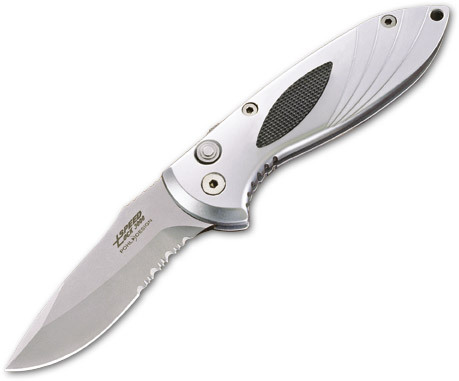 The Speedlock 3000 Boker automatic knife was introduced in 2004. And Boker has built it tough enough to last a lifetime. In America and other markets where automatic opening is restricted, the activating button of the Boker Speedlock 300 automatic knife only locks and unlocks the blade, in either the open or closed position. In markets where automatic opening is allowed, the Boker Speedlock 3000 automatic knife is available fully automatic. There is a secondary safety on the top of the handle above the button. Its purpose is to prevent unintentional opening or closing of the blade. As convenient as the activating button location is, the secondary safety seems like an excellent idea to me. The Boker Speedlock 3000 automatic knife has a 3 3/8" blade of 4034 stainless, and is 7 7/8" long overall. and a cordura sheath is provided. And will remain locked open until the job is done. Return from Boker Automatic Knife to the German Knife .com home page.